Needs ability to organize tasks by date, like console on the desktop version. Salesforce is supposed to be one of the major up-and-coming companies for data software engineers but even with the updates the app is consistently low quality. There are problems with loading reports, loading times are inexplicably slow, attachments can rarely be viewed, and the app is slow to sync with new content. There is minimal functionality from the app unfortunately and the whole thing is extremely disappointing. Sales force has saved me. I live it so much that I’ve stopped sleeping and eating. Please add a comment/notes section in the task field. I can’t simply touch a phone number to dial from a contact. I am hesitant to write this because I am very happy with the app and worried this will jinx it. There is definitely still some work to go, but have not tried ANY CRM App that has achieved my hopes of mobile access. I can get most essential things done on the move and I love it. Ability to upload files (not just photos) from cloud platforms like Google Drive, Dropbox or OneDrive would be really nice. Ability to add files right into the opportunity files screen (instead of going into the separate Files menu THEN the opportunity to link the file to it) would be amazing. Buggy and twitchy. Not smooth at all. Makes my brand new iPad feel like an old android phone. App consistently makes you scroll down the page again after it send you back to the top of the page. Takes too long to load each page. Would be very helpful to be able to download an account for offline use, even if only for that particular day. I can’t open any Objects - a blue bar runs indefinitely across the top of the screen whenever I search and select, or select from Chatter - and since I’m running 11.4 (the recommended iOS) on an iPhone X, I think it’s safe to say that the app is just broken. The majority of my work is in the field so it would be massively helpful if Salesforce could fix this very soon. Can’t find any notes from over a year ago...very frustrating. Its too slow for me. Cant keep up with how fast I have to move within the day. I waste a lot of time refreshing and clearing the cache. Sometimes I want to throw my phone out the car window, but I really do enjoy the concept. Needs to speed up!!!! Doesn’t always save information on walk- ins and appointments. It’s frustrating. So it looks like I’m not doing a lot of walk- ins to the businesses. App needs to be less clunky (stalls a lot) and more intuitive. A simpler design with customized menu (like web version) would make this app usable. This app is ok when it works. It is extremely slow. It does not mirror the website and is not intuitive. When i click a SF link in my mobile email it rarely loads and screen is often blank. It is actually quicker to open my laptop, connect to a hotspot and go to sf on the web. For as much money spent on sf it is disappointing their app is probably the one of the 10-15 worst i have ever used. Sales force has a great Sales team that will hook you into their product, after that they have terrible customer service that does nothing to help out their customers or respond to requests to help. This app, since upgrading to the iPhone X, never loads properly. I am in a way that I have to use the browser version on my phone, which really isn’t ideal for task logging on the fly or checking on reports and dashboards. Really hope that gets fixed in the near future! Helps me organize my tasks and reports. What a horrendous, awful application. This app is bad enough that it is often touted as the reason that people in my organization are unable to do 100% of their work from an iPad Pro - “I’d love to, but I need to use SalesForce on a consistent basis”. If SalesForce is Hugh Grant, SalesForce1 is Andie MacDowell; dragging down the entire operation, forcing constant recaptures of her dialog because she’s unable to enunciate properly, and generally making the whole process feel much more like a funeral than any of the four weddings. Let’s explore a scenario: You’re looking at a case record, and you’d like to communicate this case to your coworker. 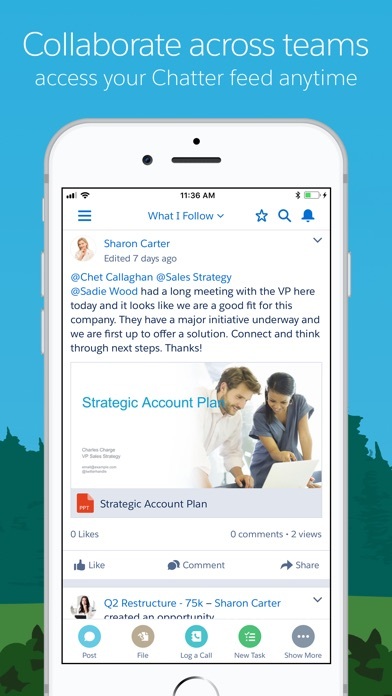 You swipe up and grab your company’s chat app to split screen - but wait, SalesForce1 doesn’t support multi tasking. That’s OK. You open up the share menu in SF1. Or rather, you try to open the share menu, only to find there IS no share menu - SF1 lacks ANY way to produce a shareable link to any record, contact or entity. You look at the case number and select it in order to copy. The cursor does not appear. You tap again. Yes, SF1 has also limited your ability to grab particular blocks of text. You’re forced to type out the case record, swapping back and forth between apps a few times to make sure that the 12-digit string is faithfully recreated. You weep softly into your Smart Keyboard and move back into your parent’s basement. Works beautifully hopefully it will stop asking me to rate it now . The ability to communicate about accounts, tasks and buyers to teammates is very helpful. This is a valuable tool in the market. Our hotel is state of the art and brand new, which means we have top tier technology. Despite our strong Wi-Fi signals throughout the hotel, I often find myself waiting for the program to finish loading. Also, their have been some unfortunate updates. An example would be in previous versions we could see all the different statuses of cases at once. That way we could quickly take notice of cases that were potentially overlooked. In a newer update, they removed this option. Because of these issues, I give it a very GENEROUS 3 stars. A little complicated, has a little of a learning curve. I’m able to manage most of my business from one app which is incredible. The productivity this app allows me is by far the best I’ve seen. Update after update this app continues to disappoint. The only functionality that always works is the chatter feature which I seriously don’t care about. I haven’t been able to search for an account for months and the scheduler feature doesn’t ever load, always says no internet connection. I’ve checked, I’m connected. Whether it’s a WiFi connection or over LTE in the field says “no internet connection tap to reload”. So I tap, it spins, I give up, open my laptop or iPad, find the record I need and move along. I keep thinking the app will work and to my dismay it never does. Salesforce mobile app, this is your precipice. Until the functionality is actually working this is a waste of time. What’s the point of having access to thousands of rows of data with no summary at the top? How does this make any sense? It’s on the desktop but not mobile so management can’t rapidly access this info on the go? Please correct! Having an issue with favorite report function. I am very much a fan of integrating technology with business, but this application is wretched. I cannot believe this is not an app in Beta. The load times are horrible, I find myself clicking 100 buttons to get to something that should be readily available. The menus are confusing and not helpful. Links to projects do not work, and I am constantly having to reload the app because it will not load images. I should be able to log calls easier. I need this to actually help me not make me work harder. I have no reason to use this other than my work is requiring me to use it. Otherwise I would be managing things from another CRM. ridiculous. Stop Spamming Me For Reviews!!!! It is a true pleasure to use SFDC, truly intelligent user experience and brilliant design. Thank goodness our company is now using Salesforce. This system is convenient, fast and easy to understand. 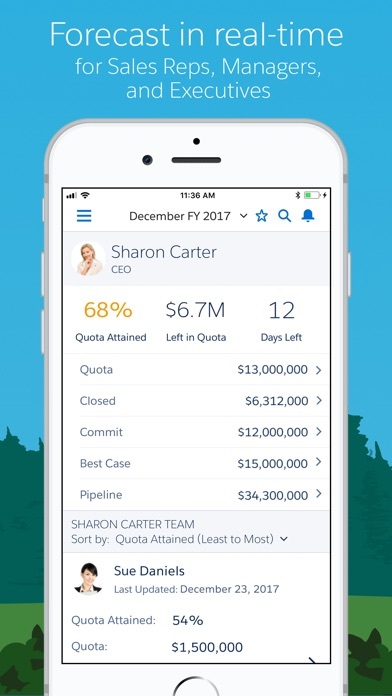 Salesforce has helped our company so much! Its great to see everything right away. While Salesforce has many good attributes I think that simplification of use could be worked on. It often has I.T. Issues and is finicky. Training on Salesforce should focus only initially what data a Sales rep needs to enter. Practice, practice, practice with an instructor until they guarantee you have it done 100% correctly would be the wisest way to train. APP NEEDS WORK BUT EVERYTHING ELSE IS GREAT. Basic functions cannot be performed. UX still terrible. Love the app as it’s easy to use. Only knock I have is that you can only attach one picture per post unless someone knows how!? It can’t support zip file. I don’t use apple maps, I use Waze, but the app doesn’t let me navigate using it. My only negative! If I do not constantly back out of my accounts and categories within them, then my app will usually crash in a day or 2. So I try to remember to back out to home page before opening a new account . Other than that, saves me considerable amount of time from having to pop open my lab top ! Salesforce is number 1 according to the Wall Street Journal. I’m finding this version of Salesforce very easy to use. So far all I’ve done is capture lead information but it’s allowing me to “brain dump” into one simple platform. Looking forward to having it help me prosper! Lentidão no sistema e carregamento das informações diminui agilidade no lançamento de atividades. 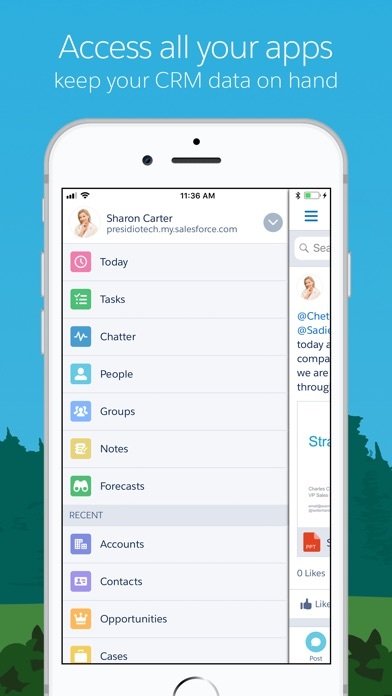 The app is Great I’m glad my company uses Salesforce for our day to day Leads the ONLY thing I wish Salesforce would do is SEND PUSH NOTIFICATIONS ALERTS on our mobile devices such iPhones and the IPad that is assigned to me from work. If Salesforce sent me notifications alerts to my iPhone phone and iPad whenever I get a new appointment on my books for example I check my Salesforce before I go to bed sometimes there is nothing scheduled for the next day then in the middle of the night or early in the morning there might be a new appointment I don’t know that got added to my books but if I got a PUSH NOTIFICATIONS to alert me to inform me that I have a 8:00 a.m. appointment 1 hour away and during early morning San Francisco’s commute time would be 2.5 hour drive in traffic it would be super nice and convenient that I got a PUSH NOTIFICATIONS to alert me so I’m Not late or notifications when there is a cancellation but MOST IMPORTANTLY my whole point for my reason why PUSH NOTIFICATIONS would better help me as a Design/Sales Consultant and Any Salesman or Saleswoman so stay and get better informed and we are informed instantly on my mobile device and I don’t see why I can get an INSTANT PUSH NOTIFICATIONS on my iPhone from Salesforce? Because When the Oakland Raiders have a game and are about to start playing Live I get a PUSH NOTIFICATION TO ALERT ME on my iPhone and when the first kickoff is about to be underway I get another PUSH NOTIFICATION TO ALERT ME and when they score a touchdown I get a PUSH NOTIFICATIONS TO ALERT ME and the score after each quarter I get PUSH NOTIFICATIONS TO ALERT ME and if I Really wanted to I just have to adjust my push notifications to get a Live Notification for play by play action during each football game and I even Notifications when there is a press conference is about to start after each game even a press conference the next day is about start and I can watch it Live on my app. Since that is already possible from the Oakland Raiders team app and every team in the NFL and SALESFORCE is TEAM PLAYER a key player in the Sales industry almost like a coach or a quarterback calling the plays for each company that RELYS on SALESFORCE to Collect & PROPERLY ORGANIZE appointments So each SALESMAN & SALESWOMAN can better serve our clients more effectively and efficiently to ultimately make & increase Sales and I believe by Salesforce sending push notifications would help and make a big difference in the way business is handled when it come to Sales and Sales Consultations. Wish this was more like the web based app. I can’t really add content. It “ok” for searching and retrieving info... I guess. Still doesn't go full screen on the iPad 11. Good thing not a lot of Salespeople use iPads or anything. The SFDC app is my favorite tool to use. It makes me more efficient, productive and streamlines my day. Minor glitches are taken care of by my favorite team member, Kristin Burkhart, who is amazing and very responsive. I wish the calendar in sales force automatically transferred to my outlook. Ever since the latest update SF drags. Cannot hardly open any Leads or Accounts. App update needs fixed ASAP or going to another CRM. Cannot do business like this. The app handles most of my CRM needs, but I can’t check for prospects that may belong to another rep, and as soon as I gave the app 5 stars I was unable to open links from my clients/prospects account. Best CRM app EVER!! Im an SFDC Admin/Developer and I really enjoy this platform. Big thumbs up! Very clunky and buggy when adding new info such as an address to an account. Sometimes the field is not visible or the keyboard obstructs the field and you are unable to scroll down. Needs work. App is an awesome resource that maximizes my ability to manage my accounts and Information. App could use improvements glitchy and crashes fairly often could use some more fluidity as far as going from the map to accounts. All in all great resource. This release says that this long awaited functionality is now available. I don’t see how to do it. help customer support? I’m just learning the software, but it appears to be the most robust CRM I have ever used! I look forward to using it to increase my sales and connecting with my clients! Should be able attach photos/videos to SMS or MMS and send from my phone. It’s a pain that I can’t perform this task out in the field. It would make follow up so much easier if I could take a photo attach it and text clients a few lines. One of my customers forces me to use this horrendous application. This app has more bugs than the insect exhibit at my local zoo. It's difficult to navigate with no explanation in the app, or from my customer, on how they want me to use it. Even worse, it crashes after every entry. Let's say that I check in at my customer's facility. If I want to enter notes or do anything else, I have to close the app and restart it. After I've done that one particularly thing, I have to again close the app and restart it to do anything else. Repeat ad nauseum. It would be most beneficial to have project filter in all 3 quote channels. This app drives me nuts. I rarely rate things online, but this app is too slow, and it freezes many times a day. I can close it, and then reopen quickly to make it work, but I shouldn’t have to. I have really liked everything so far. We are still understanding how to use the app and program at my company. I’m sure as I learn more my satisfaction with increase. 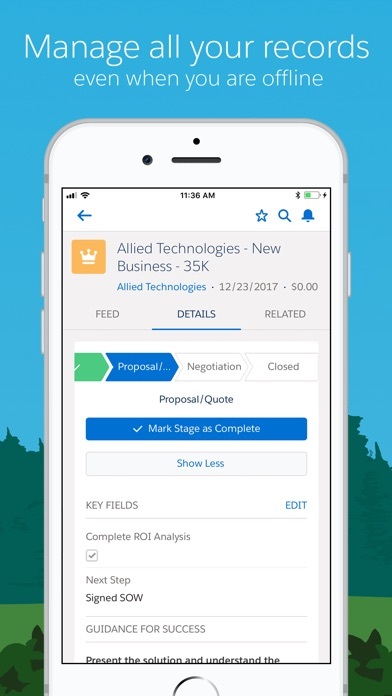 Overall the Salesforce app is not bad. I would like to see if Salesforce can add a widget for “My Tasks” in Salesforce. That way I can easily track my tasks with one swipe. Can’t use iPhone to enter notes on the account from the app. Would be nice to take notes right in the app while in a meeting. I feel like it must be the gajillion salesforce employees who rated this app 5 stars because it is quite sad and awfully cumbersome. The UI is terrible- it would be much better if the layout were more like the desktop site. It’s slow to load as you scroll up and virtually no way to even customize the view. Please throw this out and start over because I WOULD rate Salesforce as a whole a 5. Not this travesty. Much easier to you, visibility into account details and navigation are huge improvements. Would be good if the opportunities can be displayed in tabular form. Gets the job done while at home or on the go. Totally easy to use! Salesforce is awesome! This would help me to better understand where my clients and prospects are in relation to my daily travels. For example, if I have a cancellation or get out of a meeting early, I can locate other prospects and clients around me and be able to review their accounts. Works great on my IPhone. I have the same app on my work phone (Samsung) But was allowed to use in my personal phone(iPhone) and works much better and much easier to use. Greatest app for productivity in the history of manual effort and labor. In fact, the out of the box sales automation is second class to none. Salesforce is the real deal. Please add copy paste function to work orders. Generally a handy app that allows me to get deals through the approvals pipeline even when I’m not in the office. However, I’ve run into bugs that will open a prior record repeatedly when switching between screens, e.g., attachments and approval history. This means that if I view one record and then want to edit a second record, I have to be really careful not to accidentally edit the wrong record, and usually have to close and reopen the app to “force” it to flush the memory. This is a significant detriment to efficiency. I just started this job as an Account manager and this Sales Force system is very user friendly. Essentially asks for credentials every time I log in. Walks me through selecting permissions every time. Asks to set a PIN every time. Walks me through the setup of Salesforce Today every time. It’s so bad I only use it briefly and in a situation where I really need data or to provide an update and don’t have my computer nearby. If I could use the app without these steps, it would be a good tool.